The medical industry is built on paper. The file cabinets at the back of most doctors’ offices are proof of that. So when the government mandated a switch to electronic health records, all of that paper had to become digital. In those digital records, the leaders at InDxLogic saw an opportunity. Automating the process of indexing medical documents to the right patient file would save doctors the time needed to correct errors that come with manual indexing and the money needed to employ extra indexers to handle the growing workloads. While the company had success selling its solution at trade shows, it had trouble gaining traction online despite a somewhat recent redesign of its website. The site just didn’t stand out against those of its much larger competitors. InDxLogic turned to Idea Grove to prescribe a solution that would set its brand apart and attract qualified web traffic. After in-depth research of InDxLogic’s industry and competitors, Idea Grove interviewed actual buyers to pinpoint why prospects chose InDxLogic over the bigger players. The research revealed an important distinction that the company had long taken for granted: It was founded by doctors. None of their competitors could say that. And none could brag about the personalized service that buyers told us was so important. Stories of the personal relationships InDxLogic’s team formed with its clients would ultimately define and differentiate the company’s new messaging. The reason many of InDxLogic’s competitors lacked personal stories is because they were some of the biggest names in business process outsourcing, and, visually, they looked like it. 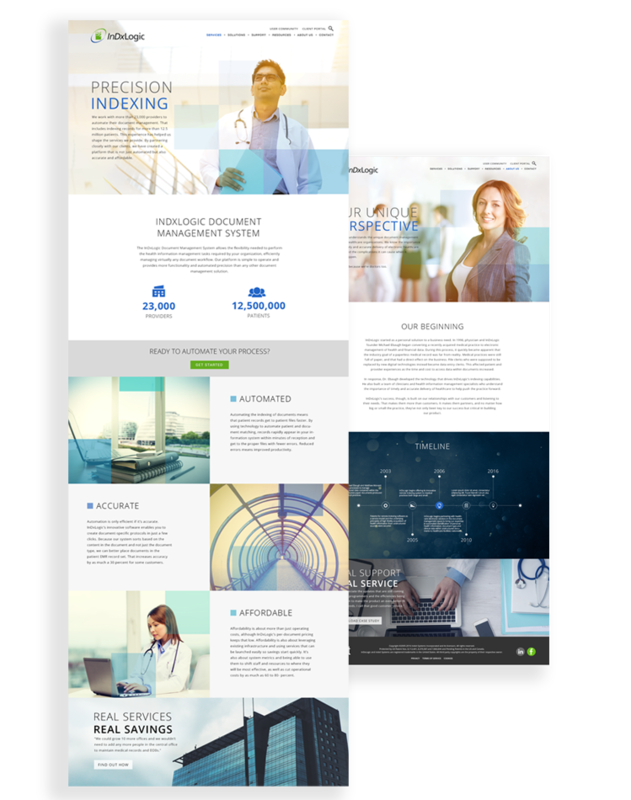 If InDxLogic was going to compete in the same market, it needed a complete visual rebrand that would allow the company to go toe to toe with anyone—while at the same time, showcasing its unique personal touch. The new look includes a modified logo, a modern typeface and a streamlined color palate that is flexible enough to work both on the web and in print and display collateral. 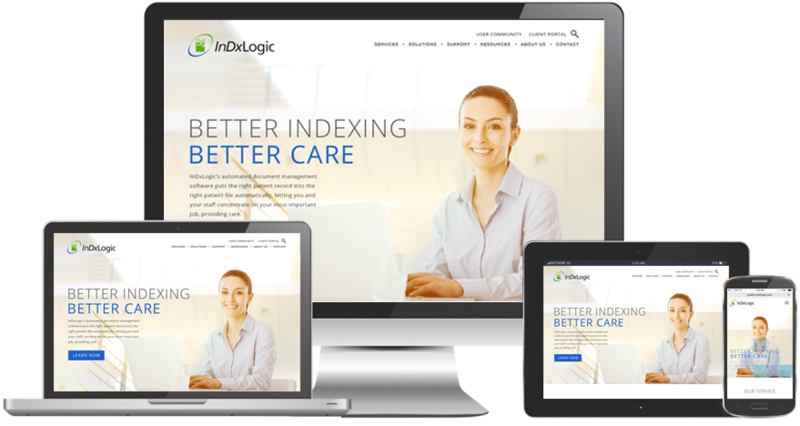 InDxLogic’s new site needed more than dynamic visuals and a differentiated message. It needed to help the company generate leads when its team was away from the trade show floor. Referring back to our conversations with their buyers, we knew that by highlighting great customer case studies prominently throughout the site we could do that. Not only did these stories prove that working with InDxLogic was a great experience, it showed that the company could deliver on its promises. And by putting those case studies behind a form, InDxLogic was able to collect the leads that it wanted. InDxLogic came to Idea Grove looking for a new website. What it left with was a brand new identity. That’s what research-driven messaging and visual branding can do for a company, no matter its size. This new branding is already helping the company as it expands to integrate with more EHR systems and additional physicians. Before the new site was even launched or the visual branding finalized, InDxLogic was already using its new look in trade show presentations and collateral to win new customers. And when they aren’t at tradeshows, their new site allows them to stand side by side with their larger competitors and deliver a message that’s not only uniquely theirs, but is uniquely effective with the physicians they are trying to reach.